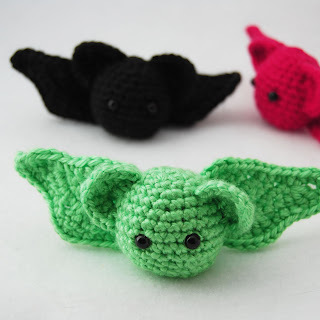 I am absolutely batty for this free pattern! After the bat wing fiasco with the inside-out pumpkin pattern, I was a little hesitant to try another patterns with wings. But, I'm so glad I did! These little guys are easy to make and super addicting. The pattern works up very quickly and all the steps were clear. Shala even includes tips for when to attach the eyes and when to stuff your project. I made a bunch of the bats -- mostly in the three colors shown above. 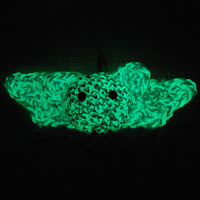 But I also had a lot of fun with a glow-in-the-dark bat (using my new Bernat Glow yarn). This bat is definitely my favorite! 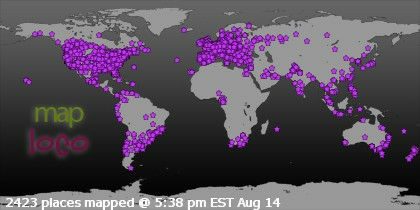 And yes, the stuff REALLY DOES GLOW! Shala's blog offers a number of other free patterns -- many of which would make great gifts. I think I'm going to have to try her alien and skull pattern real soon.